New characters and new mysteries change Sanctuary forever. The immortalized cavalry commander, Tempus, leaves Sanctuary in the hands of Straton, the witch-cursed Stepson; his partner Critias; Sync of the Rankan 3rd Commando, and Kama, Tempus's daughter. Each feels that being left behind is punishment, and may be correct. Sanctuary goes from bad to worse with the arrival of the ominous Shepherd and a disturbing god. Meanwhile two local girls, Shawme and Merricat, find arcane articles on the Downwind beach that few understand but which the Stepsons' mage believes will shape the fate of the Sacred Band. This classic Sacred Band of Stepsons story, from the 2012 Perseid Publishing anthology "the Fish the Fighters and the Song-girl, is newly revised and expanded by the author and first appeared in somewhat different form in Thieves' World(R), the million-copy bestselling fantasy series. This story centers around Kama, the daughter Tempus, the Sacred Band of Stepsons' immortal commander, and the coming of a new god -- or is something worse? -- to the blighted town of Sanctuary. This tale of sword and sorcery has everything -- suspense, humor, and mystical delights. I'd recommend it to anyone who loves heroic fiction, high adventure, and powerful men and women. If you're a fan of the Sacred Band of Stepsons series or Thieves' World(R), you'll want to hear this story told. If you're new to the Stepsons, this is a delectable way to start: dark, gritty, full of enemies, lovers, betrayal and mythic foes. Be warned, though: the Sacred Band never goes anywhere where trouble doesn't follow; this is dark fantasy that turns passionate and violent in an instant. Its mature themes make it unsuitable for young children but a great read from anyone over twelve who loves heroes facing superhuman foes in ancient times. What was one of the most memorable moments of Wake of the Riddler? What about Alex Hyde-White’s performance did you like? Alex Hyde-White's performance is a delight: edgy, fierce. He voices these characters true to their natures, and never skips a beat. I could see every scene he set, see every character he described. He summons the urgency, the fear, and the humor in these tales effortlessly, and never loosens his grip on your attention. Yes, and I did. I've listened to it four or five times, in fact, whenever I have about an hour and a half to spend somewhere mystical and exciting but dark and ominous. This tale is completely satisfying, yet makes me want to hear more stories of the Sacred Band of Stepsons. If you like Wake of the Riddler, it's one of four audio books about the Sacred Band of Stepsons; Hyde-White also narrates Mage Blood, a very much darker, more violent story than this one, and twice as long. Don't hesitate: you'll love the other Sacred Band of Stepsons audio-books: Hyde-White's narration of Mage Blood; A Man and his God narrated by David Kudler; and the heroic fantasy epic narrated by Chris Morris, The Sacred Band. Excellent Narration of Classic "Sacred Band" Tale! If you could sum up Wake of the Riddler in three words, what would they be? Kama, Tempus' daughter, the only woman in The Sacred Band, fighting against stereotypes and family baggage. Have you listened to any of Alex Hyde-White’s other performances before? How does this one compare? This is the first performance I have heard as an audible book, but I have seen his performances as an actor which I quite liked, and have just adored his father, Wilfred Hyde-White ('Colonel Pickering' in "My Fair Lady" - my mother's favorite movie) and his ex-father-in-law, Roy Dotrice, and their wonderful classic work. This was a novella and, yes, I wanted to listen to it all in one sitting. This performance is an absolutely marvelous example of the narrator's art. I am very familiar with, and a great fan of, Janet Morris' work since I discovered her in the late 70s-early 80s. 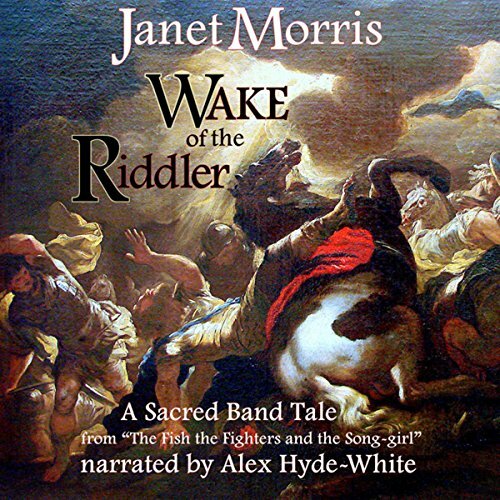 The Sacred Band is a group of characters that were originally created in the Thieves' World(r) books of Robert Lyn Aspirin and Lynn Abbey, by Janet Morris when she wrote for the series. The Sacred Band subsequently moved on with its main character, Tempus, into novels and other stories.Mr. Hyde-White gives the work the feel of antiquity that is appropriate to the tale, the setting and writing. I am extremely pleased by this initial foray into the audible world by the characters of The Sacred Band and the treatment given the story by Mr. Hyde-White; he uses a terrific selection of voices, with none of them "overdone" and his pacing is exquisite. I hope to hear him do many more of Janet Morris' and her husband, Chris Morris', works. More adventures from Tempus and the Sacred Band. Super characters, including Shawme and Merricat embellish these amazing pages and inspiring tales. A cascade of magnificent stories in the series and the epic transcendental works from Morris.